When considering an online solution to communicating with the members of the small UU fellowship in Mount Vernon, WA, we decided to use MeetUp.com. The congregation is very small, semi-rural, and far-flung. We wanted to create more community-building activities, classes, etc., both at the church and in the towns where members live, but it was hard to get people together for anything besides Sunday morning activities. Also, we wanted to empower all members to suggest and initiate activities without having to wait for leadership to come up with them! Another factor was that there is a digital divide: many older members are not active online. Many people recommended Facebook to us, but we wanted to explore other solutions that would help us with our main concern, community-building, and that would not require a lot of maintenance. MeetUp.com turned out to be a quite good solution. It is extremely easy for any authorized person (an Assistant Organizer) to announce an activity and get a reading of how many people are interested and likely to attend. I made every MeetUp member who was also a member or friend of the congregation an Assistant Organizer. Activities can be planned far in the future or on the spur of the moment. I found it necessary to have a small training to get the non-digital-savvy folks to sign up. The Organizer has total gatekeeping power. What we decided to do in Skagit was to set it up so that anyone from the public can see what’s going on, but only people who are known can join the group. Because MeetUp has no ads, it costs $15 a month. It’s easy for members to set their email preferences and the like. It was EXTREMELY easy to set it up and it looks quite nice. A real bonus is outreach: if someone is looking at MeetUp for activities in their neighborhood, or looking for Unitarians, they will easily find the church. To try it out, browse to “MeetUp.com” and enter “Mount Vernon, WA” and “Unitarian” – or just browse MeetUps near Mount Vernon. 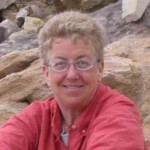 You will find Skagit Unitarian Universalist Fellowship. 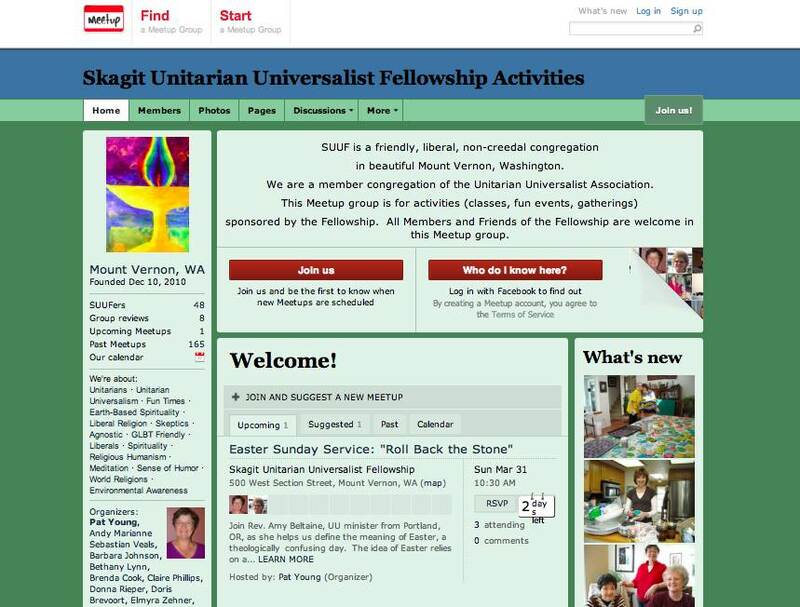 When I left Skagit UU Fellowship and started serving South Fraser Unitarian Congregation in Surrey, British Columbia, I was delighted to see that they already had a MeetUp group: http://www.MeetUp.com/surreyunitarians/. The MeetUp page has been directly responsible for attracting at least one wonderful new couple that has joined the congregation. MeetUp pages look AWFUL if no one is maintaining them – but very simple to update – easy to plug in the next worship service, suggest outings and activities, and list the upcoming events of the congregation. Best practice is to make everything look fun and attractive, and include photos. I would be more than happy to explain MeetUp to anyone who is interested. It can be a real boon to a congregation – almost like having an extra staff person. Amanda will take questions in the comment area or you can contact her directly.